"Only intakes in meat and [zinc fortified] groups met estimated average requirements [for zinc]." Intakes aren't the same as what gets absorbed though. Unfortunately, not only did the non-zinc group have low intake, it also had low absorption. The total zinc absorbed (from breast milk plus food) was highest in the meat group (0.80 mg/d), next highest in the zinc-fortified group (0.71 mg/d), and lowest in the iron-only group (0.52 mg/d). "Conclusion: Zinc requirements for older breastfed-only infants are unlikely to be met without the regular consumption of either meats or zinc-fortified foods." "The bioavailability of zinc from vegetarian diets is lower than from non-vegetarian diets because vegetarians do not eat meat, which is high in bioavailable zinc and may enhance zinc absorption. In addition, vegetarians typically eat high levels of legumes and whole grains, which contain phytates that bind zinc and inhibit its absorption." "Vegetarians sometimes require as much as 50% more of the RDA for zinc than non-vegetarians." The RDA for adult men is 11mg, women 8mg. So, vegans may want to shoot for: men 16.5mg, women 12mg. But no child eats only flour meal! If zinc is so hard to get on a vegan diet I don't see why we shouldn't eat some meat. What kind of a diet is good if you have to take pills with it? Even the Okinawan ate some meat. Most vegans don't eat vegan only for matters of health, but also for ethical reasons. In that vegan forum, Jeff Novick starts out by saying "The DRI for zinc for adults males is around 11 and for adult females is 8." But he says that this is too high, and that "the actual need is around 4-11." Novick says, "So, many of us, who are eating very healthy, may be "aiming' for a DRI of zinc that is not applicable to us and we may need much less." So, he's saying that vegans may need less than the DRI of men/11 and women/8. But then he links a report by the WHO/FAO which states the recommended intake for zinc for vegans is men/17.1 and women/14.4 ... which are not only higher than the DRI, but higher than what the NIH says is advisable for vegetarians. How is that list much more useful Laurie? I never even heard of calabash or chayote. Or were you making a joke? And 2 cups of raw bamboo shoots? Where do you buy those? 2 cups cooked mushrooms in one sitting? What kind of a serving is that? Who can affort to buy and eat that amount of mushrooms? Besides they don't keep you have to keep buying them. This isn't a useful list for me. I wish there was better language in discussing such issues, though I’m coming up blank for the moment with coming up for alternatives. But the common idiom used in trying to achieve a difficult undertaking easily is often referred to as wishing to “take a pill” to solve the problem. But okay, I can appreciate the sentiment not to pop pills to solve every problem, metaphorical or nutritional. I’m not going to double check it for accuracy or serving amounts, I’m going with the assumption that these plant foods add some amount of zinc to a diet to be considered useful sources. Some of those I eat fairly regularly, but some of the others... Calabash? I don’t think I’ve had that. Now I have to go and try to find it. I didn’t need a reason to eat more endive, because I love it. My partner isn’t all that fond of it, but now I’ll play the zinc card. It’s not like eating from that above list is going to make you fat or unhealthy (unless one believes that legumes and grains are fattening and unhealthful, which I don’t). But perhaps that just me. Because factory-farming exists because everyone wants easy zinc (that is supplemented to the livestock anyway and if you asked the average person they wouldn’t have a clue about zinc). I don’t really have a health argument for you to never eat meat, but for those interested in the idea, all I can offer is that it’s certainly doable. If I’m fine eating no animal products, certainly others can easily be healthy eating a lot less. While I share your sentiment to a certain extent, there’s little reason to assume it as a dogma. It is not unreasonable that a pill that could extend health and longevity could be a possibility. Okay, that’s more of a philosophical answer, but administering shots in the arms of children have suppressed the multitude of illness and suffering associated with communicable disease. A health pill isn’t so far fetch, that’s what vaccines are in a way, a one time dose that increased potential longevity for hundreds of millions of people. Though I agree, in the context of a daily or weekly longevity-supplement now, that it’s plausibility at the moment is very low. However, supplementation in some form or other prevents deficiency as it does in the case of iodine in salt, vitamin A&D in milk, folic acid in bread, pre-natal supplements for women, etc, then there is little reason to assume that any supplementation whatsoever is inherently bad for you or should be shunned on some sort of dietary purity principal. Also, the tacit assumption here is that everyone is eating the way they do for health. That nonvegans are a collection of robust individuals with the concern of deficiencies or diet related illness being irrelevant. Most people pursue a diet with health being the furthest thing from their mind. Vitamin deficiencies and diet related diseases of all sorts exist, and plenty of non-vegans take all sorts of pills and supplements and even drugs to counteract the effects of their eating habits. Most people’s food priority is habit and taste, which I can empathize with. However, as a vegan, I think some ethical and environmental consciousness can be mixed in. Luckily these desires complement each other and we don’t have to sacrifice much. Though, I’m far from being some sort of saint; there’s always room for improvement. If every meat-eater in the world ate as much meat as the long-lived Okinawans, we’d collectively be much better off. 94% of calories from sweet potatoes, rice, wheat, barley, other grains, and legumes! I wouldn’t go so far as to say that I’m a skeptic of RDA (or DVI) values. I think they are useful, but I take this notion that we absolutely need X amount of nutrients every single day, with a grain of salt. My guess is though, at least according to what I know regarding the 1950s Okinawan diet, is that they probably didn’t meet the recommended daily allowance of zinc either. Nor was it likely that they took zinc supplements. Yet they are the longest-lived, healthiest people on the planet. Likewise, the mostly vegetarian Seventh Day Adventists are the longest lived people in North America, and their diet excludes high animal sources of zinc as well. So, what should we make of this information? Vegans, and everyone else, should be aware of sources of zinc in their diet and perhaps even supplement, however, it’s not worth getting too worked up over. I don’t understand this sort of criticism. Most of the commenters here feel that cooking is best and a variety of whole-food plants are desirable. This goes for other diet advocates as well, whether low-carb, paleo, traditional, whatever. People are fond of quoting Michael Pollan’s “Eat food, not too much, mostly plants.” But in the context of veganism, the suggestion that one buy and eat whole foods from their supermarket produce section is scoffed at. Sure, I understand what people are trying to get at, that poor people can’t afford good quality food. But this criticism has far more to do with our economic and social structures than veganism per se. It’s not like more animal products solves these problems. Nor is it all that wonderful that poor people in the developed world must rely on subsidized factory-farmed animal products and over-processed junky carbohydrates laden with added sodium, fat and sweeteners usually served at American food establishments. That’s the current standard and I don’t think it’s worth tacitly defending, which is what happens when it’s made out like eating plants and fungi is made out as some sort of elitist herculean effort. I’m not one to suggest that everyone must become vegan, but integrating some good old cheap rice and beans style meals into anyone’s diet is certainly possible and better than a franchise restaurant value meal. And “the grains, beans and greens” don’t have to be organic or locally grown either, conventional fair found in regular supermarkets are perfectly fine. Fine for health. Fine for the cost conscious. Fine for alleviating environmental pressure animal food production creates. There are demographics of people who won’t blink an eye at the suggestion of eating calabash or chayote since they are already accustomed to eating it. Some of the other foods are fairly mundane. I’ll give you that calabash is exotic to your “normal” food shopper, but the tone sounds as if regular people never buy or eat mushrooms, and well, mushrooms just aren’t highfalutin well-heeled fair or anything. People put the things on pizza. They even come pre-sliced in cans. I prefer fresh mushrooms myself, and I don’t feel burdened by preparing or eating them, but canned is fine if people prefer the convenience. But perhaps I’m way out of touch here, perhaps more people than I suspect really can’t fathom eating mushrooms. There’s probably some truth to this, but I really have trouble believing that the general audience here falls into that category. Pedantic nitpick ahead. McDougall’s forum isn’t a vegan forum per se though I’m sure there are vegans participating. It’s plant-based nutrition forum, or McDougall Diet forum. McDougall eats animal products, though rarely, and his program does not outright exclude them either. More importantly than what McDougall eats, his views regarding the question of whether animals should be viewed as human resources is unclear (as far as I know). Also, there will be participants in the forum who don’t identify as vegan, they are just tying to eat healthfully. People tend to think I’m being the vegan police when I point this out, but I do so because there is a difference. It’s often assumed that the moniker of “plant-based” or “plant-strong” diet is used to obscure a vegan agenda, but often (not always), that’s not really the case at all. McDougall (Ornish, Campbell, Esselstyn, etc.) just really do think that eating a whole foods plant-based diet (that may or may not exclude animal products) is the healthiest. Novick did say that he thought that RDA is generally inflated in the first place, not so much that vegans per se need less, but that people are different and the RDA are padded with a margin of safety to account for people who may have absorption issues. But yes, that’s more his informed opinion backed with some understanding of the subject. I tend to agree with him, but it’s more my personal feeling so I’m not inclined to offer it as anything more. I think most people, vegan or otherwise, would have difficulty meeting every RDA values every single day without supplementation, but it’s still worthwhile to have a number out their for people to shoot for. That’s a fairly strong statement (there could be “some” evidence even if it’s weak) but I’m willing to accept this statement as factual because as a vegan RD, Messina has her bias, but her motivation is to ensure the nutritional safety of people who want to be vegan. She isn’t interested in proving that veganism is the ultimate diet ever, she’s more interested in informing vegans correctly so that we can continue to be healthy, happy vegans. If there were a cause for alarm for general vegan zinc deficiency, she would say so. Finally, regarding the first linked zinc study on feeding infants pureed meat. I’m not going to tell people what to feed their children; I’ll just offer some more data that isn’t derived from the lab. In the Tennessee (mostly) vegetarian community called The Farm, all the births were recorded and the health outcomes of the infants were fine. This data is often used to support natural child birthing since the delivery success rates were very good. (If you’ve seen the Ricki Lake’s documentary The Business of Being Born, they refer to this group as a positive example of natural birth outcomes but don’t mention their vegetarianism, which is actually sort of relevant.) Does this prove that zinc is not a concern for infants, vegetarian or otherwise? Certainly not, but with such examples along with Okinawan and other plant-based eater’s outcomes, we can keep such deficiency concerns in their proper context. I’m no expert though, I just play one in blog comments. What do you think about RDA/DVI Bix? How crucial is it to meet those recommendations every single day? I'm happy to call it plant-based. I have read Dr. McDougall's books. He advocates a diet that is low-fat, plant-based, and devoid of animal products. Although I have heard him say that he eats turkey on Thanksgiving so as not to be labeled a vegan. About the zinc ... I respect the IOM's analysis. They look at the body of evidence, they parse it, compare and contrast it, look at the population they want to apply it to. I've read their manuals. They're exhaustive. I'm familar with the coefficient of variation. I would not feel comfortable telling a client that it's fine to shoot for a daily intake that differs from what they recommend. I don't have the expertise nor resources to do what they do. "Changes in activity of zinc metalloenzymes during dietary zinc restriction or excess have not been consistent in experimental studies with humans or animals." "Erythrocyte metallothionein concentrations decreased rapidly in humans fed a phytate-containing diet of very low zinc content (Grider et al., 1990). Erythrocyte metallothionein concentration appears to be a measure of severe zinc depletion, and the extent of a change in concentration can distinguish between low and adequate levels of zinc intake under experimental conditions (Thomas et al., 1992). Erythrocyte metallothionein and monocyte metallothionein messenger RNA concentrations increase with elevated zinc intake levels such as those encountered with dietary supplements (Grider et al., 1990; Sullivan et al., 1998). Studies of metallothionein concentration in blood cells or plasma during large human dietary trials have not been undertaken. Consequently, the use of metallothionein as a static or functional indicator of zinc status needs further study." "Transit time also influences the extent of absorption to an extent that, in malabsorption syndromes, zinc absorption is reduced." "In humans, plasma zinc concentrations are maintained without notable change when zinc intake is restricted." "Individuals with malabsorption syndromes including sprue, Crohn’s disease, and short bowel syndrome are at risk of zinc deficiency due to malabsorption of zinc and increased urinary zinc losses (Pironi et al., 1987; Valberg et al., 1986)." 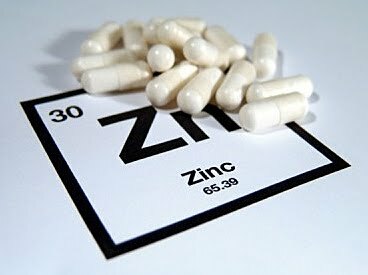 "Therefore, it has become increasingly apparent that homeostatic mechanisms fall short of perfection and that clinically important features of zinc deficiency can occur with only modest degrees of dietary zinc restriction while circulating zinc concentrations are indistinguishable from normal." "Consequently, the amount of protein in the diet is a factor contributing to the efficiency of zinc absorption. ... In general, zinc absorption from a diet high in animal protein will be greater than from a diet rich in proteins of plant origin such as soy (King and Keen, 1999)." "Plant-based foods, particularly grains and legumes, have a significant phytic acid content. ... Phytate binding of zinc has been demonstrated as a contributing factor for the zinc deficiency related to consumption of unleavened bread seen in certain population groups in the Middle East (Prasad, 1991). The overall effect of phytate is to reduce zinc absorption from the gastrointestinal tract through complexation and precipitation (Oberleas et al., 1966)." "In most older adult and elderly populations, vegetarians have lower zinc intakes than non-vegetarians (Brants et al., 1990; Hunt et al., 1988; Lowik et al., 1990)." "The requirement for dietary zinc may be as much as 50 percent greater for vegetarians and particularly for strict vegetarians whose major food staples are grains and legumes and whose dietary phytate:zinc molar ratio exceeds 15:1. Long-term alcohol consumption is associated with impaired zinc absorption and increased urinary zinc excretion. Thus, with long-term alcohol consumption, the daily requirement for zinc will be greater than that estimated via the factorial approach. I'm trying to eat vegan but it's hard with these foods I never heard of. Bix's list had oatmeal and beans and I can do that. I'm sorry but I don't understand this list by Laurie. I don't know what 100 grams are. I had to look it up. I eat one mushroom at a time sliced which is about a tablespoon cooked. And Laurie's list says, when I do the maths that it only has .09mg zinc. I'd have to eat 2 cups cooked to get 3 mg! And 9 whole zucchini! One zucchini is only 11 grams and if I ate just one whole it's only 0.4mg zinc. And by the way when I looked up 100 grams of raw endive which I can't even find in my market it says 0.8mg zinc not 4.5. The 4.5 is for a whole head at 513 grams. These things are expensive to buy in this quantity for a family. Have you seen the price of wild rice? I don't eat most things on this list like bamboo and alfalfa seeds and tritical. I like sesame seeds but 2/3 of a cup?! You could say eat a lot of anything and it would have tons of vitamins. This list doesn't make any sense. If I had a salad with a cup of endive and sliced mushrooms and a whole zucchini and sprinkled sesame seeds it wouldn't even come up to 1 mg zinc! And these are the best plant sources? I don't know how everyone gets their zinc is all I'm saying. It looks like it would be pretty hard to get the recommended amount without supplementing. and use their tool called "Nutrient Search Tool." You can put in "zinc" and find familiar foods that are good sources. You can change the way it finds them from 100 grams to 200 calories. That might help. Thank you for the heads up on endive! Since this study was supported by the National Cattlemen's Beef Association, is it any surprise that it recommended feeding meat to kids? And isn't it convenient for them that they compared meat with highly processed cereal grains, which can be devastating to the digestive system? Why didn't the article discuss any good lacto-vegetarian food sources of zinc, like beans, yogurt, cashews, Swiss cheese, milk, or almonds? Oh Jim, good eye! It's a fair criticism. The list isn't a joke. 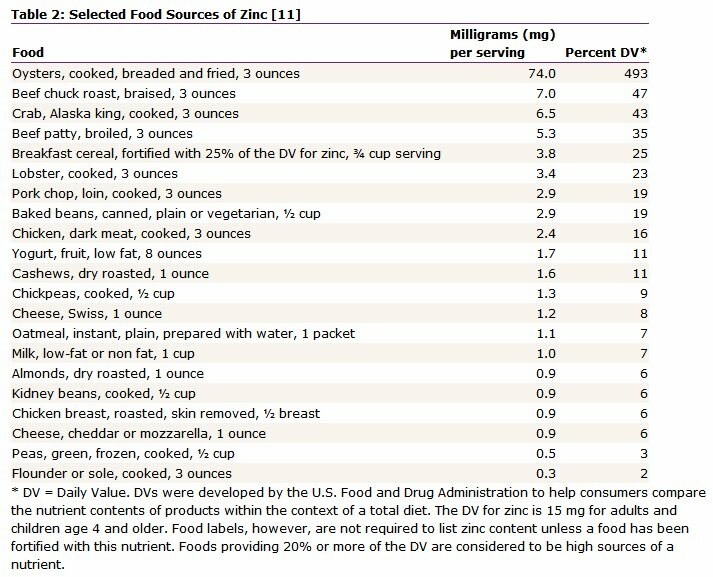 The point is that lots of plant-based foods contain appreciable amounts of zinc. Calabash is a common vegetable in many Asian cuisines. Claudia asked why we shouldn't eat some meat. The answer is simple. When we look at the epidemiologic data, we find that eating even small amounts of animal foods is associated with a small but measurable increase in the risk of death from chronic disease. You can get enough zinc without exposing yourself to an increased risk of breast cancer. Thank you shaun and Bix. I went to the site and a lot of meat comes up as high in zinc. Who knew emu was a good zinc source!? And ready-to-eat breakfast cereals like Cheerios but they probably have zinc added. But I found something, peanut butter! 2 tablespoons has 1 mg. Woohoo! Back in school we'd remember what foods were good sources of zinc by "zinc follows protein."